If you think that the Grand Cherokee SRT with its 475-horsepower, 6.4-liter Hemi V-8 is bonkers in all the right ways, then the 2018 Jeep Grand Cherokee Trackhawk will have you in stitches. It stretches the concept of a performance SUV to its absolute maximum and will go on sale late in 2017. The name Trackhawk might sound familiar -- Jeep released an off-road-oriented version of the Grand Cherokee last year called the Trailhawk. 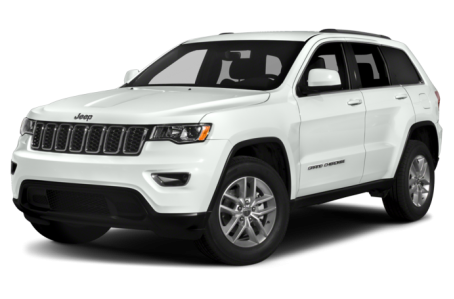 That one was designed to go further off-road than any other Grand Cherokee before it. This one is designed to go faster on the road (or the track). The front of the Trackhawk features Jeep's signature seven-slot grille and has extensive modifications to feed air to the thirsty engine and cooling systems, such as removing the foglights to optimize airflow. On the sculpted hood are dual heat extractors that both look cool and aid with cooling. Other unique styling touches beyond the hood include side sill cladding, body-colored wheel flares and a gloss-black rear valence that houses the black chrome exhaust tips. Twenty-inch wheels are standard, with a satin chrome center cap; optional low-gloss black alloy wheels are 12 pounds lighter. The Trackhawk also gets all-new rubber: Pirelli 295/45ZR20 Scorpion Verde tires are standard, with Pirelli P Zero three-season tires (with an increased speed rating to match) also available. The cabin is accented in carbon fiber and metal, while the seats are wrapped in standard Nappa leather and suede. Also available is a Signature Leather Interior Package, seen in these photos, with an embossed "Trackhawk" logo on the front seats. The Trackhawk's in-cabin technology is geared toward performance as well. The instrument panel has a center mounted tachometer, flanked by the speedometer on the left, which reaches all the way up to 200 mph. In the center console is an 8.4-inch touchscreen that has been customized to add Trackhawk-exclusive Performance Pages, which can display information like real-time engine output, four-wheel-drive configuration, a gear reader and various track timers (zero-to-60 mph, zero-to-100 mph and braking distance). The pages also allow the driver to activate launch control and setup custom drive modes. The Trackhawk features the same engine found in the Dodge Challenger and Charger SRT Hellcats, a 707-hp, supercharged 6.2-liter V-8 that makes 645 pounds-feet of torque. The supercharger provides up to 11.6 psi of boost and spins at a maximum speed of 14,600 rpm. An eight-speed automatic transmission with paddle shifters is standard, as is 4WD. The 4WD system features a single-speed active transfer case and an electronic limited-slip rear differential, along with a stronger rear axle to handle all that power. The numbers from Jeep are jaw-dropping: zero-to-60 mph in 3.5 seconds, quarter-mile sprint in 11.6 seconds and a top speed of 180 mph. Then you remember that this is also a 5,000-plus-pound mid-size SUV, and all of those college physics courses make even less sense. To help hit these numbers, launch control is standard, along with a Torque Reserve system that provides a quicker initial response to boost acceleration even more. There are five selectable drive modes, each offering unique transmission, 4WD torque split, steering and adaptive shock absorber settings: Auto, Sport, Track, Tow and Snow. The list of standard safety technology is long, with adaptive cruise control, blind spot monitoring with rear cross-path detection, autonomous forward emergency braking at all speeds, front and rear parking sensors, and a trailer hitch camera view, which lets the driver check on a trailer through the backup camera while traveling at speed. There is also a (necessary) Valet mode, which locks out first gear and significantly reduces power and torque. It won't allow manual shifting through the shifter or the paddle shifters, and it disables launch control while leaving the stability control in "Full-on" mode. This mode can be turned on and off using a four-digit PIN. 19 of 19 (100%) consumers said they would recommend this vehicle to a friend.